Early in the morning, while most of us are grabbing a cup of coffee before work, a nurse is on the road. She helped get her own family ready for the day, and she is on her way to take care of your family. One of our billing specialists is on the phone, helping a patient make sense of what his insurance will pay for a recent treatment. And a team of doctors and nurses is preparing an operating suite for advanced robotic spine surgery. The people of Hartford HealthCare are a team of 20,000 healers and helpers who serve all of us seven days a week, 52 weeks a year, in nearly 300 sites across Connecticut. They are working to build and sustain healthier communities, families and individuals. Much of their work is invisible – until you need them. This page in the Connecticut Mirror will be a window into their world – and yours. Healthcare touches all of us. It gives us the power to stay well and gives us hope in the wake of illnesses and accidents. It’s also a big investment for employers, government and families. In America, healthcare is far from perfect. It has many moments of real brilliance – including incredible medical advancements. But it can be uncoordinated and impersonal. And the overall cost of care needs to come down. I want to use this space to begin a conversation about healthcare. 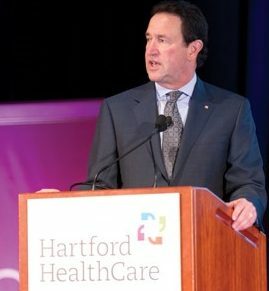 I want to showcase the great work of the people of Hartford HealthCare and to shine a light on issues that come up in this world that touch your world. It could be a pioneering new treatment or the economic impact of healthcare in Connecticut. (Health policy issues may seem distant and abstract – but some directly affect your health, your wallet and the quality of life in your community.) I intend to contribute to this page along with some of the people with whom I’m privileged to serve. Thank you for joining the conversation. Let’s see where it leads. Join us each week on the Connecticut Mirror for meaningful healthcare conversations.